Leicester Square tube has what can be said to be a fairly unusual London Underground symbol. Its just like the rest, round, and its special, has the old style Johnson typeface pre 1930’s. Very unusually in terms of tube history these older roundels were introduced in 1935 (which by then was by then the modern Johnson typeface era) when the new Leicester Square tube ticket office and entrances were opened. Whats different with this compared to the others? Well its thin compared to other LT tube roundels. Usually they are quite full in the middle, but this one is lean, thin, as if it has seen better days. Its sort of what is a size zero tube roundel. 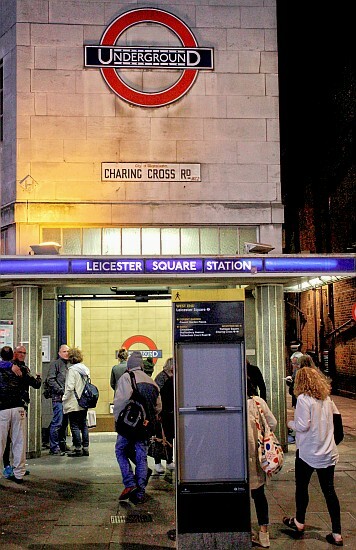 All the other Leicester Square tube roundels are of the standard type – as well as those right across the tube network. Its a very large one and possibly its uber-sized credentials meant it had to be somewhat thinner than usual. Perhaps this was done due to considerations of weight? Its a rarely used design – here’s a LT Museum pic for 1933 showing the same styling. Compared to other tube roundels this has the unusual distinction of white bordering on both sides of the girth. Others of similar vintage have a single one white border on the outside circumference. 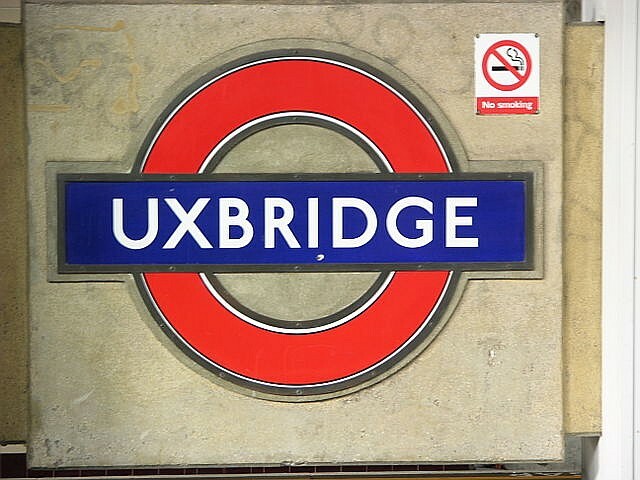 As far as I know there are just a handful of other places where tube roundels are bordered white on both sides, including at Cockfosters and Uxbridge. Their roundels are of normal girth hence the Leicester Square one remains unusual. The sign has yet one further distinction. The nameplate (the blue oblong middle bit) has white borders, which is an extreme rarity on the tube. The only other example I know of is at Paddington tube (Praed Street) entrance. Clearly that at Praed Street is a later version of the Leicester Square variant as it uses the later variant of Johnson typeface. 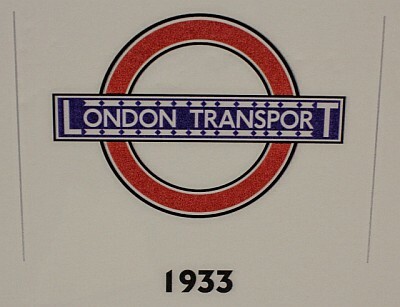 As previously mentioned the roundel appeared at Leicester Square in 1935. One wonders if these were imported from elsewhere because photographs show not one but three of these! (There were a fourth and fifth of slightly different calibre, with the legend ‘TRAINS’ in huge letters inside the orignal Charing Cross Road entrances). Of the three styled ‘UndergrounD; the second was just inside the Hippodrome entrance, as this picture from the LT archives shows, whilst the third existed at the former Little Newport street entrance. 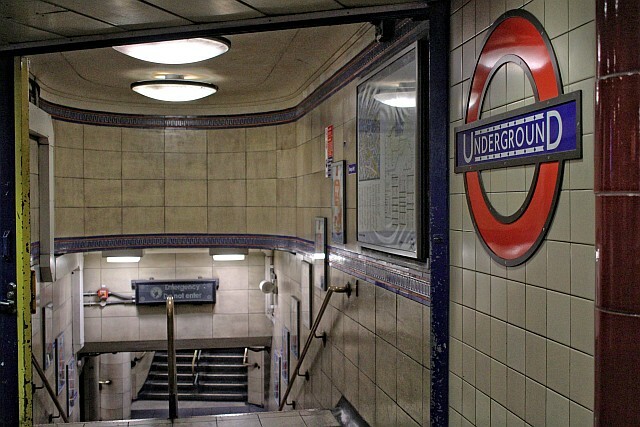 Above: Cranbourn St entrance showing the tube roundels that are used today. The remaining thin roundel has been through different phases of appearance. Originally showing ‘UndergrounD’ this was changed to a plain ‘LEICESTER SQUARE’ during the 1950’s. The white border around the name was removed and made the roundel look quite ugly. At some later unknown date it was changed back to the much better looking original. One wonders why the roundel has survived so long, the only explanation seems that it’s location high above Charing Cross Road might be a possible reason. Note May 30th 2016: It appears the thin type of roundel was one widely promoted and used by the LTPB in the 1930s. Other examples of its use has emerged. It appears the broader style of roundel was soon a preferred choice over the thin one. Clearly the one at Leicester Square tube is a rare survivor of that particular style of roundel. Note July 18th 2016: The new TfL poster that has appeared at tube stations across the network detailing the evolution of the roundel shows the design for 1933 with the much thinner appearance that’s survived at Leicester Square. See my post on this.